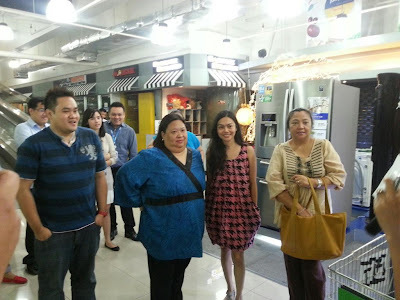 Members of the press and some bloggers including yours truly were able to witness a fun shopping spree event. 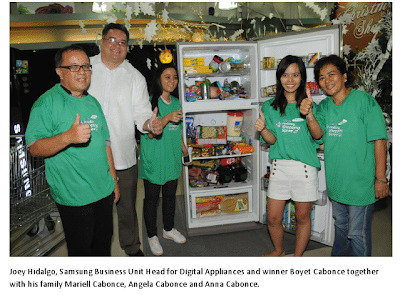 A few days ago before Christmas, Samsung treated their wiinners of "Have a Smartlife Holiday Shopping Spree" promo a 20k-worth of grocery items at Rustan's supermarket in Mandaluyong. As a fun and exciting holiday challenge, winners are tasked to put their shopping skills to the test by gathering as many items as they can under time pressure. And because four shoppers are better than one, the winners get the chance to invite three of their family members or friends to assist them with the challenge. Once their time is up, the winners get to keep all the products they managed to gather under the P 20, 000 prize budget. My favorite group among the winners is the Cabonce family. As we watched them shop in haste, I could feel their determination to maximized the amount and the time limit they have to bring home worthy products from the spree. Plus they are the only team who have three girl members, which only proves that girls can beat the stronger men when it comes to grocery shopping chore. Every member of the family is focused and they know which products they will be getting from the shelves and which sections they will go, they've strategist well enough before their turn. Looking at the 2 full push carts as they were heading home, I could say they got the most! Good job Cabonce family! The other two groups are composed of barako mens and I could also feel their determination to bring home everything from the supermarket. The last group bagged quite a lot of liquors in their cart, hehe. Some photos from the event courtesy of Samsung Philippines. 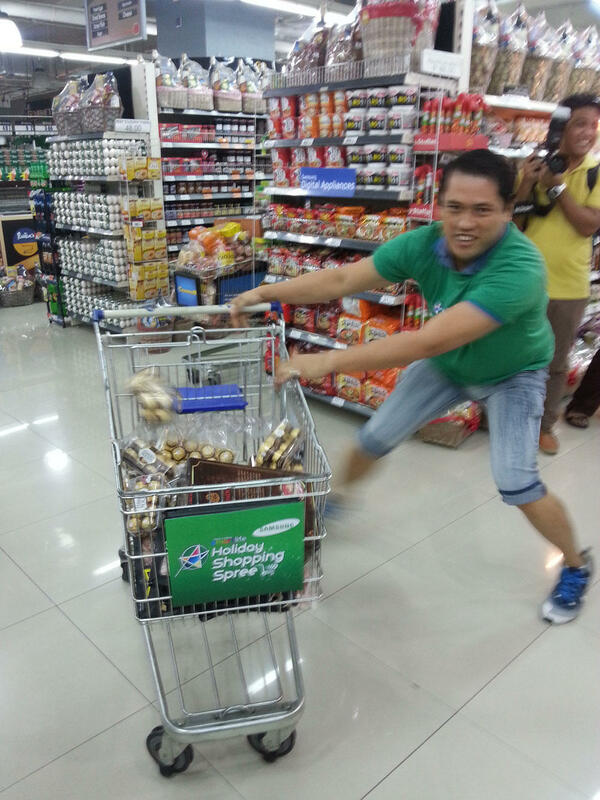 Some lucky members of the media also won a chance to have a shopping spree! 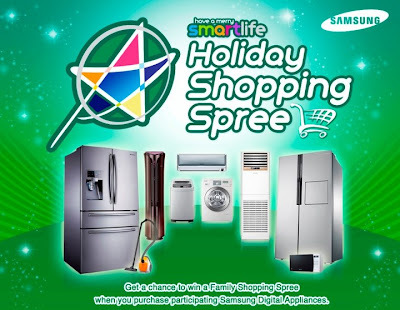 You could also be one of the lucky winners of a shopping spree courtesy of Samsung Philippines. Read on below for more details about the promo and the mechanics on how to join. Merry Christmas! 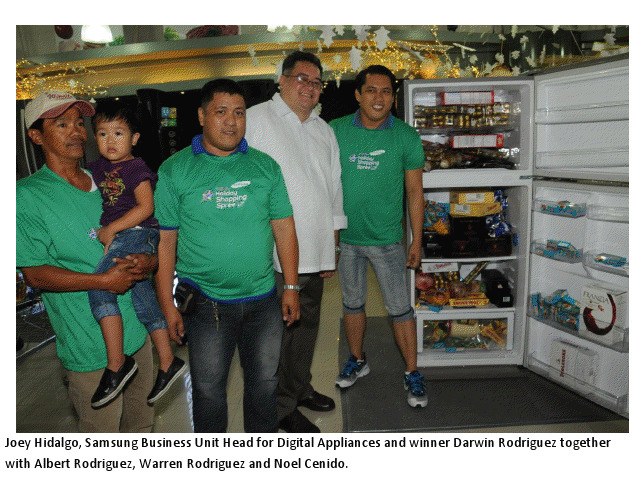 In the spirit of this season of gift giving, Samsung Electronics Philippines Corporation (SEPCO) is sponsoring a nationwide shopping spree. From November 15, 2012 to January 15, 2013, by simply purchasing a Samsung Digital Appliance, customers will be rewarded with discounts, freebies, and the chance to win the raffle for a P 20,000 shopping spree. After spending on gifts for loved ones, reunions, and trips out of town, at this time of the year, a little extra cash is certainly appreciated. How does one join? 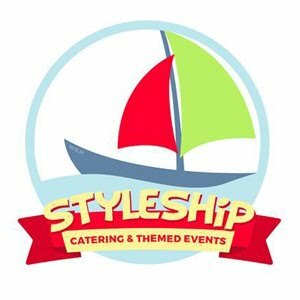 For every P2, 500.00 purchases, a customer is entitled to one raffle entry, and for every product bought, a customer can earn maximum of 20 entries. With such high chances of winning, it can’t get any easier because all it takes to register for the raffle via SMS are a few simple and easy steps. At the end of the raffle, sixty lucky winners from all over the Philippines will win a shopping spree worth P20,000 each just in time for the holidays. Save on your spendings for festivities this season by signing up for the Samsung Holiday Shopping Spree today! For more information, make sure to “like” the Samsung Facebook page at http://www.facebook.com/SamsungPH, and to follow Samsung on twitter at @SamsungPH. 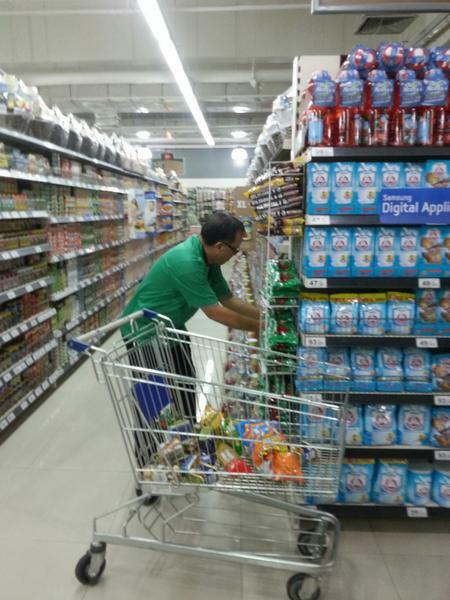 This is an exciting contests as you get to test your shopping skills in hopes of taking home the items. How fun and exciting! 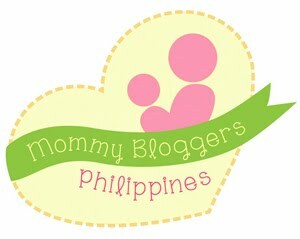 Kudos to Samsung for organizing a great event for bloggers this Christmas. 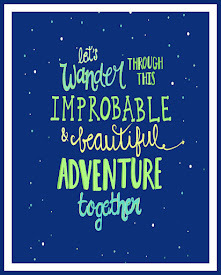 This is so awesome to partake with :) Everybody happy. Kudos to Samsung! Wow! Thanks for sharing this promo of Samsung. I'll tell this to my friends and family who might get interested in buying Samsung product before the promo period for a chance to win a shopping spree. Papaleng is right (naunahan niya ako), this contest looks like from Eat Bulaga. I like this kind of challenge.I always dream on being one of the contestant. 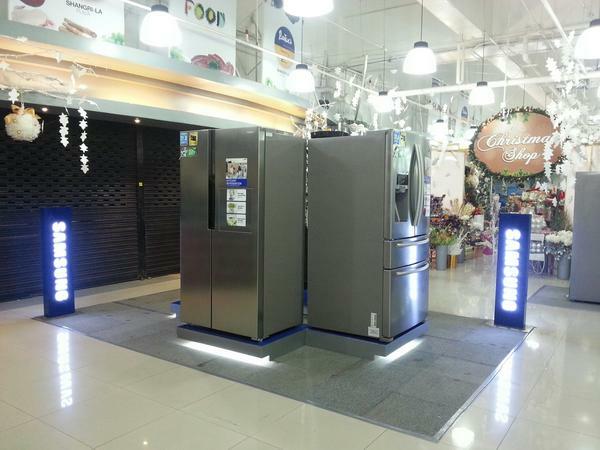 Ang galing naman ng naisip ng Samsung and Rustans. 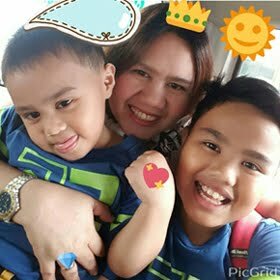 Wow great blessings this Christmas, hope to win like this, so exciting and fun. This is a wonderful experience and really a good gift for Christmas. Congrats to these people! Amazing contest! A good holiday gift for later's celebration. I like when they race to the groceries they want. That is fun! Swerte naman! Mas maganda sana kung yung mga mismong mong samsung phones ang hahkutin paramihan. Indeed, its nice to do some shopping especially in time for the holidays. But having a shopping spree like Samsung gives out is really more fun. Wow!! Super exciting and really fun!